Need to clean the grout in your shower cubicle? Over time, the grout in your shower will become discoloured. Here’s an easy, natural cleaning method for cleaning grout in your shower area. 1. Fill a spray bottle with 50% white vinegar & 50% water and spray on the area of grout you are cleaning. Let it sit for 5 minutes. 2. Using a grout, scrubbing or toothbrush, scrub into the grout area and rinse with warm water. 3. In a small bowl make a paste of bi-carb of soda and water. Dip your brush into the paste and work it into the grout. 4. Spray the area with your vinegar & water solution. The vinegar will cause the baking soda to foam up and start to work away on that nasty soap scum build up. 5. Use your brush and get all the way into the grout lines to remove the build-up. Rinse with warm water. The best way to save yourself from the heavy grout scrubbing experience is to spray down your shower tiles with a 1:1 vinegar and water mix before you get out of the shower once a week. Clearly label a spray bottle “Shower Spray” (remember to put it up high, out of the reach of children if applicable) and keep it in your shower. 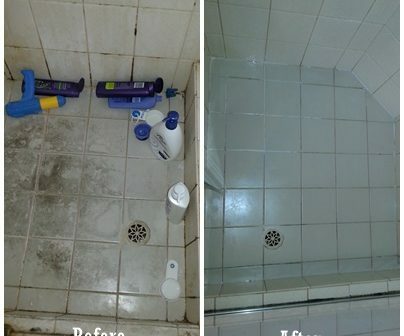 Cleaning grout in the shower area isn’t one of our services on its own, however, it is part of our shower screen cleaning service, when we remove hard water stains & calcium build up off glass shower screens. Should you require this glass cleaning service, please call us on the number below or click on the Get a Quote button. 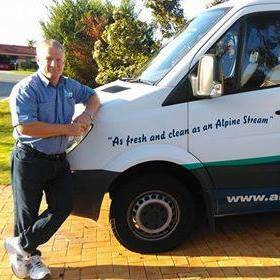 Please refer to our Shower Screen Cleaning page at https://www.alpinecarpetcleaning.com.au/shower-screen-cleaning-perth/ for information on our full shower screen cleaning service. Happy Cleaning from the Cleaning Guru! Please note that this and any other tips given in our Blog, are to assist you in minimizing any discolouration or staining damage. Please follow instructions and measurements carefully as use of different quantities may have unintended consequences. These tips do not take into account individual circumstances, and we cannot be held responsible for any claim or action that may arise from using the information on this website.